Well-chosen curtains are an integral part of a cozy room. 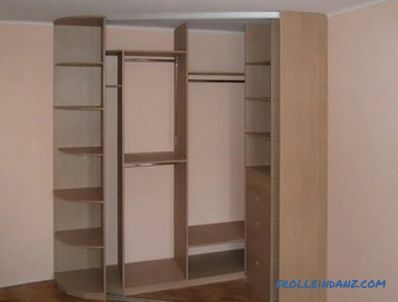 Modern technology of their fastening offers to use the wall cornice. It is easily attached to the ceiling from any material, allows you to hang curtains and curtains in several rows and is a decorative detail of the interior. Eaves on the ceiling visually increase the height room and allows you to hide behind a layer of curtains minor defects on the walls. 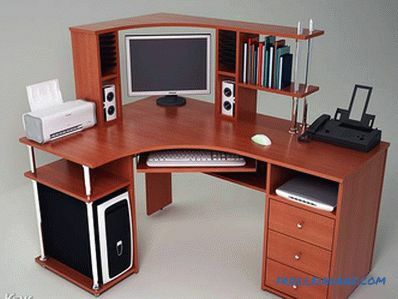 Products can be divided into several types. Wooden, combined with the interior in a classic style. Metal - durable cornices for decoration of rooms in a modern style. Plastic - lightweight and inexpensive products that can remain inconspicuous or become an interior decoration if a baguette is used. multi-row - a system comprising from two to four tracks, which allows create a multi-layered composition of curtains, tulle and pelmets. When choosing a curtain rail for curtains, you need to figure out which weight is calculated. 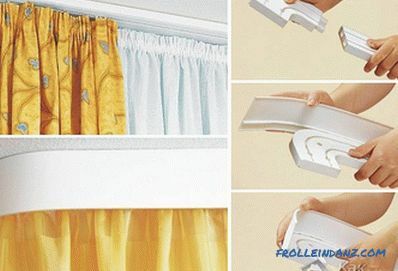 Under the considerable weight of the fabric, the plastic eaves can bend, for heavy curtains it is better to use metal fasteners. The required length of the cornice is simple to calculate: you need to measure the size of the window opening and add 40 cm to it. If the windows are arranged in a row, then 30 cm are added to the width of the opening. 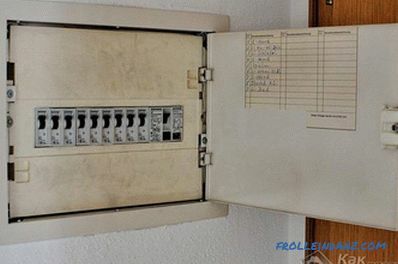 The removal distance of the eaves from the wall should be sufficient so that the hanging curtains do not touch the window sill, window handles and batteries. When fully opened, the curtains should completely release the window opening. are drilled After selecting products need to decide how to fix the ceiling cornice? Installation of the product to the concrete ceiling begins with a markup. Then the eaves strip is cut to the desired length with a hacksaw. At the ends of the tire are put on plastic plugs that come in the kit. A hole for a self-tapping screw is drilled in the middle of the eaves, and drills of two diameters are used — first by the size of the screw cap and then by the thinner drill bit. Further, these holes are made along the entire length of the strap. 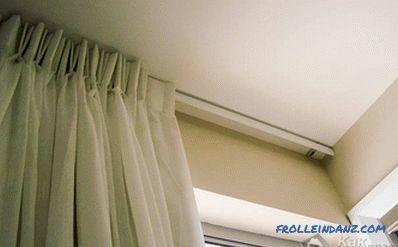 Their pitch is 60 cm, if you need to hang heavy curtains, the distance between fasteners is reduced. The cornice is applied to the ceiling parallel to the window opening. Through the hole in the middle there is a mark on the ceiling and with a punch there is a hole for the dowel, the screw is twisted. Align the bar with the level, mark up and drill the remaining holes. The dowel-nails are fixed along the entire length. 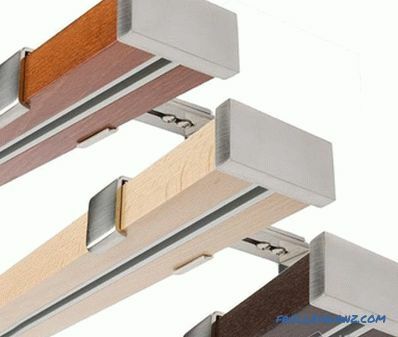 If mounting the eaves on ceiling is impossible, then it is attached to the wall with brackets. To make it even easier, because you need to drill a lot less holes. All parts are assembled into a general structure. 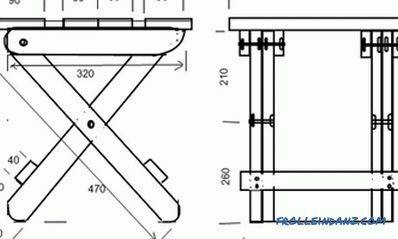 The plank is applied to the wall at the installation site and the attachment points are marked through the holes in the brackets. The perforator is used to drill holes and insert dowels. The cornice is screwed to the wall with screws. You can install the mortgage bar during the installation of the suspended structure. Fix the anchor, the length of which allows you to capture 5 cm of the ceiling. 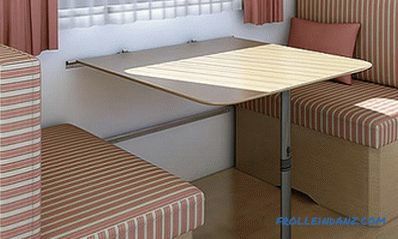 The plank for light curtains can be attached simply to the plasterboard with dowels "butterflies" and "umbrellas". This fastener, after screwing in the screw, opens and increases the bearing area. Multi-tier design, he will not hold. For a multi-row tire, you will need to mark points on the ceiling through the holes in the eaves and drill deep aisles under the anchor. A wooden bar bolted to the ceiling is used as a bookmark for the eaves. It should not protrude beyond the drywall plane, and its dimensions should exceed the dimensions of the ceiling cornice. 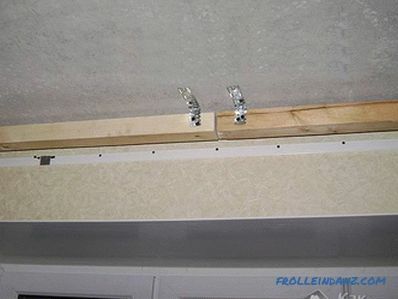 Mounting to the timber is carried out according to the technology of fastening to the concrete ceiling, only it is not necessary to drill holes in it. 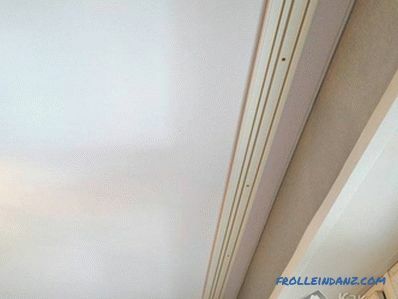 Installation ceiling cornice to stretch ceiling is quite difficult to do, because the canvas is not designed for the load.To plan the installation of fasteners for curtains, you need to fill in a wooden bar in the chosen place in advance. Its bottom edge should be flush with the stretched canvas. On the film in place of the bookmark marks are put, they are mounted on the eaves. There is a second method of installation, it is more complicated, but provides the original appearance of the structure . Stretch ceiling is not installed close to the wall, but indented, resulting in a niche. Its size should correspond to the size of the installed eaves. The bar is fixed directly on the ceiling. Near to 3-5 mm a wooden bar is impregnated with an antiseptic. 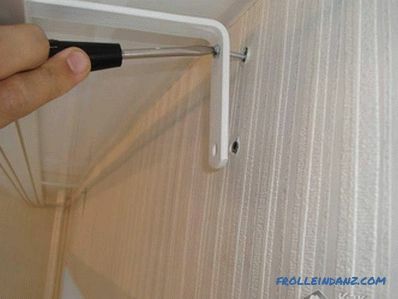 A fixing profile for a vinyl film is fastened to it from the side of the eaves. After tensioning the canvas, the wooden bar will be completely hidden.